Home » Police Force » Police Vibhag Bharti 2016 - Madhya Pradesh. Police Vibhag Bharti 2016 - Madhya Pradesh. 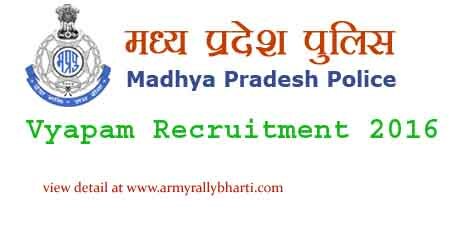 Madhya Pradesh Vyapan Recruitment in police department for the post of Assistant Sub Inspector, Subedar and Platoon Commander. Vyapan Police bharti important dates. Note:- Rs 70 will be applicable as MP Online portal fees. Bachlor degree required for the post of Assistant Sub Inspector, Subedar and Platoon Commander. Age limit:- Candidates who are aged between 18 to 28 years are applicable to apply. additional age relaxation will be applicable as per MP government rules and required MP Domicile.